Sold by IMPACT BOOKS (4.6 out of 5 stars | 45 ratings). Originally published in Marathi in 1989, this contemporary classic details the history of women's participation in B. R. Ambedkar's Dalit movement for the first time. Focusing on the involvement of women in various Dalit struggles since the early twentieth century, the book goes on to consider the social conditions of Dalit women's lives, daily religious practices and marital rules, the practice of ritual prostitution, and women's issues. Drawing on diverse sources, including periodicals, records of meetings, and personal correspondence, the latter half of the book is composed of interviews with Dalit women activists from the 1930s. These firsthand accounts from more than forty Dalit women make the book an invaluable resource for students of caste, gender, and politics in India. A rich store of material for historians of the Dalit movement and gender studies in India, We Also Made History remains a fundamental text of the modern women's movement. Ships from and sold by IMPACT BOOKS. "It is indeed a proud achievement that a book written originally in Marathi...has been made available in English so soon. The book has marked the paths trodden by the pioneers of the movement. It is a treasure to Dalit and Dalit feminist studies [and] throws open seminal issues in feminist historiography."--A. Mangai "The Hindu " "[A] timely and elegant translation..."--Anupama Rao "The Book Review " It is indeed a proud achievement that a book written originally in Marathi has been made available in English so soon. The book has marked the paths trodden by the pioneers of the movement. It is a treasure to Dalit and Dalit feminist studies [and] throws open seminal issues in feminist historiography. 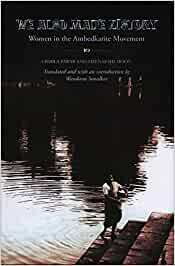 --A. Mangai "The Hindu "" [A] timely and elegant translation --Anupama Rao "The Book Review ""
Urmila Pawar is a Marathi writer who has published several short story collections, including Motherwit, also published by Zubaan. Meenakshi Moon was a close associate of B. R. Ambedkar. Wandana Sonalkar teaches economics at Dr. Babasaheb Marathwada University, Aurangabad, and is a founding member of Aalochana Centre for Documentation and Research on Women.